Aren’t they cute? What could be cuter than a penguin in a sweater? Adorableness aside, these cute little guys NEED sweaters! These guys are Little Penguins and live down under. 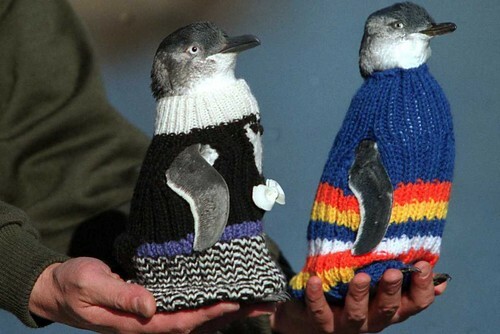 These knitted penguin jumpers play an important role in saving little penguins affected by oil pollution. A patch of oil the size of a thumb nail can kill a little penguin. Oiled penguins often die from exposure and starvation. Oil separates and mats feathers, allowing water to get in which makes a penguin very cold, heavy and less able to successfully hunt for food. When oiled penguins are admitted to the Wildlife Clinic at Phillip Island Nature Parks, a knitted jumper is placed on the penguins to prevent them from preening and swallowing the toxic oil before they are washed and the oil removed by staff. This entry was posted in Projects for Good and tagged Crochet, do good things, help a penguin out, knitting, penguin, penguin sweaters, projects for good. Bookmark the permalink. ← Sewing bug bites again!